Let’s keep it clean for everybody to enjoy. This includes all footpaths and any green areas alongside. This applies to our parks and any wooded areas within or alongside our parks and open spaces. If in doubt, Bag It Bin It! Failing to clear up after your dog is anti-social, smelly and can spread diseases that affect both humans, such as toxocariasis, and dogs, such as parvovirus. Unfortunately, dog poo issues are often caused by just a few irresponsible owners. 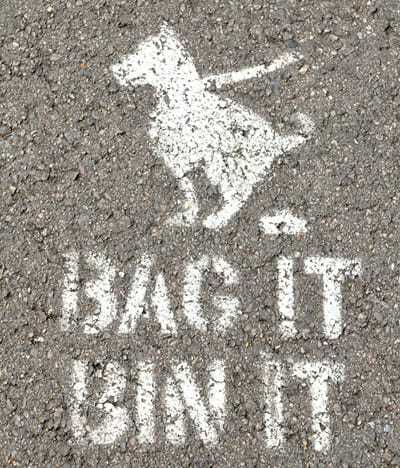 If you see another dog fouling, encourage its owner to ‘bag it’ and ‘bin it’. Do you know of an area that is regularly fouled and not cleared? Do you have information about a dog walker who fails to pick up? Please try to provide as much detail as possible and contact the Town Council Office. Dog fouling is an offence and can attract on the spot fines of up to £1000. Please don’t throw your poo bag over a fence, hang it from a tree or leave it on a path. Place your poo bags in a dog waste or dual purpose bin. If this is not possible, take the bag home and put it in your own bin.